First of all, I would like to thank my reader Ng Shao Wei for giving me this idea. She told me, she tried my roast pork recipe, but pan fried it instead. And so, I'd like to try it out myself too! 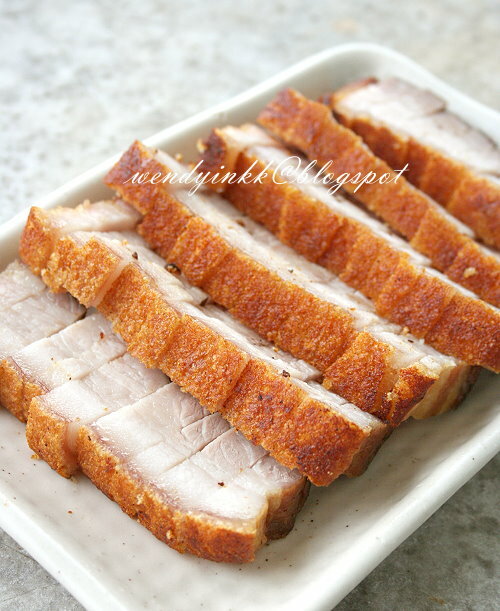 *If it's a rainy day, the pork will sadly stay crispy for an hour only. 500gm pork belly, skin on, preferably the middle cut from a big piece of belly. 1. Place belly skin side down and sprinkle the mixed seasonings over and pat them in. 2. Flip over and sprinkle salt over and make sure the salt is evenly dispersed on the skin. 3. Let it sit in the fridge for 2-3 days, uncovered. 1. Heat a non stick pan on medium heat and then put in the belly, skin side down. With your fingers, press the meat down so that the skin gets evenly heated up. Soon you will hear crackling sounds, let it fry for 1-2 more minutes until the skin feels really hot and seems to have shrunk compared to the meat. 2. Flip the belly over and put in 2 Tbsp oil. With the help of a spatula, press the meat down to ensure the meat gets even heat. Lower to medium low heat and continue to fry until the meat looks very very golden. 3. Flip the belly over, skin side down now. Press so that the skin touches the oil in pan. Cover with a lid (find a pot lid that is suitable if ur pan dun have a lid). Let it cook until the skin is all golden brown and crispy. Remove the lid and you may need to press down certain parts to get golden. 4. Use a pair of tongs, fry each side of the meat until lightly golden. 5. Fry the skin one last time and then let meat cool off before chopping with a sharp knife. Meat must be cool. Let the skin side face down. Use a sharp cleaver. Start with a slight sawing motion to penetrate then cut all the way down firmly until you reach the crispy skin. One hand with cleaver, the other hand hit the blunt side of the cleaver to chop through the crispy skin. Wow....really drooling now even though I just had my lunch. This is my most favorite. ..thanks for sharing this recipe. Wendy, very true, the most headache is the cleaning the oven after roasting. 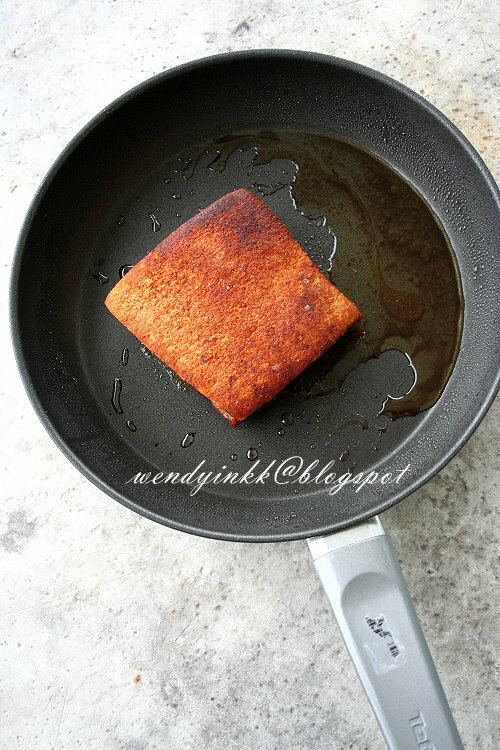 Yr pan fried looks juicy and appealing too! 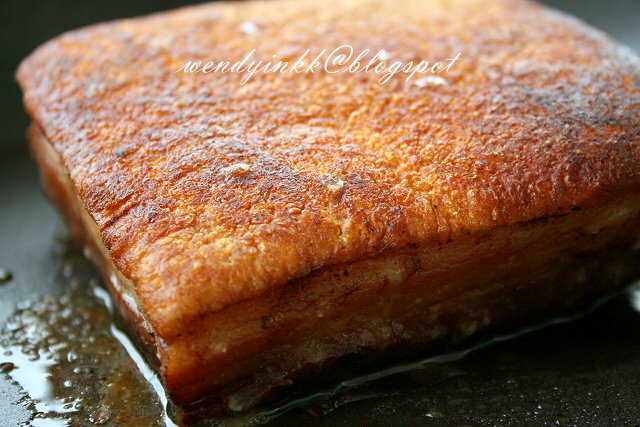 Will try this one day..you know my favorite is pork belly...heehee..thanks for the recipe..
Do you thaw the pork first before cooking? Let it come to room temperature? It shoulf sit in fridge or freeze? but i think the recipe is suits for young piggy, the older will turn out very though and chewy??? don't you think that i'm right??? It was never frozen. No need to thaw. Nope, this is from an adult pig and we all eat adult pigs here. will the whole house smell , after the cooking? you know, that type of smell that lingers for a day or two.. It depends on your kitchen and how the ventilation is done. Mine dissappears almost immediately because I turn on the cooking hood. "3. Let it sit in the fridge for 2-3 days, uncovered." 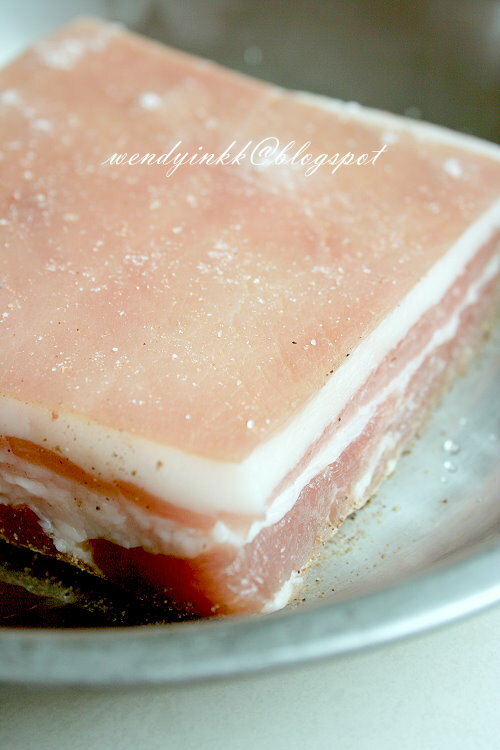 Can a piece of raw pork stay refridgerated for 2-3 days? My wife always insist raw meat have to be freezed if not used within 24 hours. Yes it can, it is salted. I didn't prick the skin. Frying time depends on how you fry it, as said in the recipe, it can take up to 20 to 30 minutes of slowly frying it. Just take note of the instructions. Hi Wendy, loved your blog. 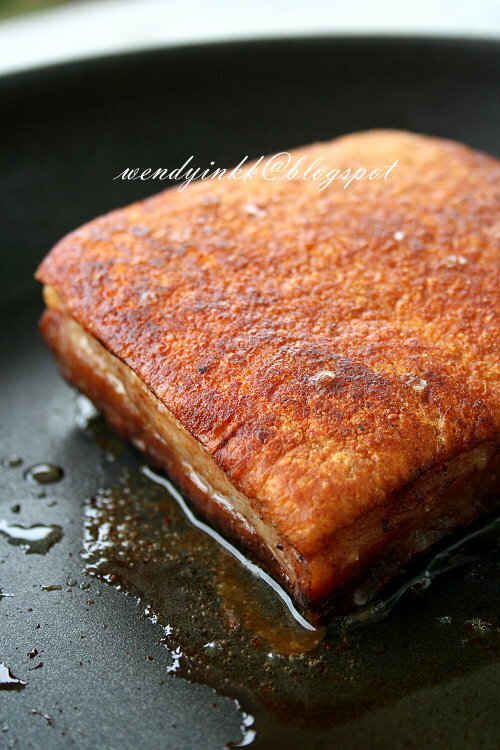 i've tried this pan fried roast pork recipe of yours... truly amazing ! loved it! Thank you !!! Nowadays I'm cooking with pink Himalayan salt. You can use regular salt, not the very fine type, and not the very coarse type. Around the same grain size as fine granulated sugar. I tried your recipe. But the skin got burnt. could it be my pan? Few reasons, your heat, your pan, your timing, your visual judgement. When things start to get burnt, you can see and smell. Then reduce the heat accordingly.